At Orthodontics and Dentistry for Kids we offer parents the option of getting night guards or sports mouth guards in order to protect their children’s teeth. There’s no denying that children, with all their energetic playing and vigorous activities, are highly prone to tooth loss or other types of oral injuries during sports. Even at night when they are asleep, some children exhibit signs of bruxism, where they constantly grind their teeth together. To make sure that your child’s teeth are kept safe from injury in any of these scenarios, the dentist at that Orthodontics and Dentistry for Kids recommended that children get night guards or sports mouth guards. Why Would A Child Need A Night Guard? Night guards prevent children from grinding their teeth at night, which, if left untreated, could have destructive effects on their teeth and gums. Night guards act as a cushion for the teeth to alleviate the pressure from the constant clenching and grinding and to prevent chipping, fracture, excessively worn teeth, or premature loss of the teeth. A night guard is best obtained from a dentist so that the child is given a custom made piece that will fit comfortably inside their mouth during sleep. Parents will be able to tell if their child needs a night guard if they hear grinding noises at night or see that the teeth are worn down due to grinding. Sometimes, children will have sensitivity because the grinding has exposed the nerves of the teeth. It is extremely important to have a dentist check the teeth and identify if a night guard could protect them from further damage. Why Would A Child Need A Sports Mouth Guard? Most dental trauma occurs when children are playing sports and get hit by a ball or fall to the ground. Often such trauma results in the premature loss of a tooth or the dislodgment of other teeth. To protect against such accidents, sports mouth guards are recommended. Once worn over the teeth sports the mouth guard will prevent any injury from affecting your child’s teeth. Why Have A Dentist Fashion A Mouth Guard When They Can Be Obtained Over The Counter At Most Drug Stores? Sports mouth guards or athletic mouth guards can be obtained over-the-counter in many athletic stores, and come in different varieties. Stock mouth guards are ready-to-wear and are generally inexpensive, but the fit cannot be adjusted and could pose a problem for some children. Boiling and bite mouth guards are also readily available and are made of a thermoplastic material that can be molded to the shape of the child’s teeth after it has been heated to become more pliable. This, however, could prove to be a challenge because some children cannot insert the correct teeth and tongue pressure to create a good mold. The best sports mouth guards are those that are custom fit to the child’s mouth by a dentist. These can give the child optimal protection against injuries that he may inadvertently get during rough physical activities. 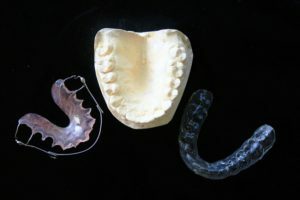 To learn more about pediatric night guards and mouth guards in Jacksonville or call for a consultation.